Wall Street Journal writer William Mauldin reported on Monday that, “President Donald Trump on Monday sought to use his threat to slap tariffs on steel and aluminum imports as leverage to extract concessions from North American trading partners, while his party’s congressional leaders worked to derail a proposal that they said could spark a trade war. Mr. Mauldin explained that, “In the Oval Office later, Mr. Trump said, ‘We had a very bad deal with Mexico, we had a very bad deal with Nafta,’ and said the U.S. had been ‘ripped off‘ by its trading partners. A recent update at FarmPolicyNews focused on the potential dangers of Chinese retaliation that targeted agricultural products, like soybeans, and Bloomberg writer Alan Bjerga reported last week that, “U.S. soybean farmers are concerned at the prospect of retaliatory trade measures from China, which has become the biggest buyer of American bulk farm products. 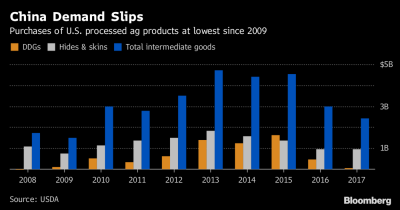 But there’s already one category of U.S. agricultural goods that China is buying less of: lightly processed, or ‘intermediate’ items that lie between raw commodities and finished consumer products. 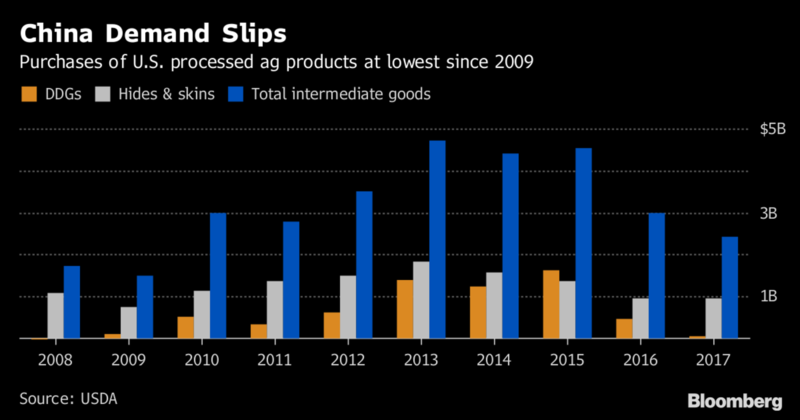 That’s mainly due to China’s shunning of U.S. Distiller’s Dried Grains, an ethanol byproduct fed to cattle, and falling demand for animal hides. 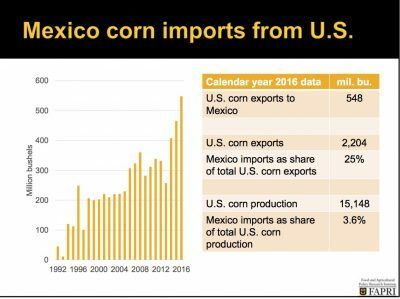 China, the biggest buyer of intermediate farm goods in 2015, now lags behind Mexico and Canada. “China Is Already Importing Less of These U.S. Products,” by Alan Bjerga. Bloomberg News Online (March 2, 2018). Meanwhile, Rachel Bade and Doug Palmer reported on Monday at Politico that, “Congressional Republicans are frantically lobbying President Donald Trump to reconsider his move to slap tariffs on steel and aluminum — even considering legislative action to try to stop him if he refuses. Tariffs and trade wars are a loser for the American people, driving up costs on working families. Kansans and our agriculture sector that’s already seen its income cut in half over the last half decade will be hit especially hard. @POTUS should reconsider this course of action. The Politico article noted that, “Republicans are still hopeful they can persuade Trump to change course. After all, they’ve had success doing so on immigration and guns in the past few weeks. In more detailed reporting on the closing of the seventh round of NAFTA renegotiations on Monday in Mexico City, Adam Behsudi reported on Monday at Politico that, “U.S. Trade Representative Robert Lighthizer warned on Monday that the United States is prepared to break up NAFTA into separate agreements with Canada and Mexico if it can’t make headway on its priorities in the renegotiation. ‘We would prefer a three-way, tripartite agreement. If that proves impossible, we are prepared to move on a bilateral basis if agreement can be made,’ Lighthizer said at the close of the seventh round of talks Monday in Mexico City. And, Brianne Pfannenstiel reported on Monday at The Des Moines Register Online that, “Iowa Gov. Kim Reynolds said Monday that ending the U.S. trade agreement with Canada and Mexico, the state’s top export markets, would have ‘devastating’ effects on the state’s farmers and manufacturers. 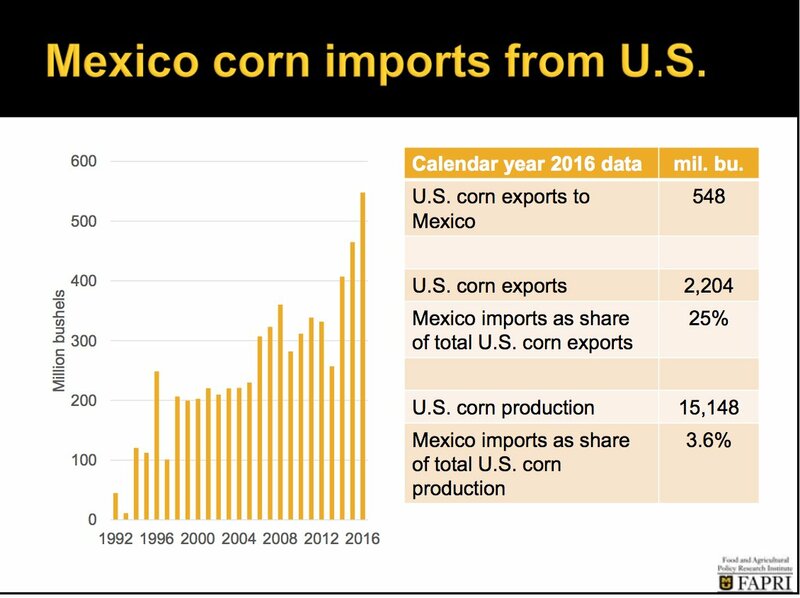 Mexico Cron Imports from U.S. “The Ag Policy & Market Outlook: What Now?” University of Arkansas webinar presented by Dr. Pat Westhoff, the Director of the Food and Agricultural Policy Research Institute (October 5, 2017).